Timing / Cam Belt Kit. Wiper Blades / Kits / Arms. Track / Tie Rod Ends. Bump Stop / Dust Kit. ABS / Wheel Speed Sensor. FOR AUDI Q7 TR-60SN 09D AUTO TRANSMISSION GEARBOX PAN SUMP FILTER ATF III H OIL. 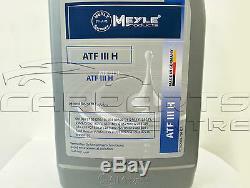 MEYLE GERMANY --- 1 x Automatic Transmission Oil Pan / Filter SEAL 6 x 1 Litres of MEYLE ATF III H KIT INCLUDES 16 MOUNTING SCREWS FITS Description Model Year Body Style kW HP cc AUDI - Q7 (4L) - 4.2 FSI 03.06 - 05.10 Closed Off-Road Vehicle 257 350 4163 AUDI - Q7 (4L) - 3.0 TDI 03.06 - 05.10 Closed Off-Road Vehicle 155 211 2967 AUDI - Q7 (4L) - 3.0 TDI 06.09 - 05.12 Closed Off-Road Vehicle 165 224 2967 AUDI - Q7 (4L) - 3.0 TDI 03.06 - 05.08 Closed Off-Road Vehicle 171 233 2967 AUDI - Q7 (4L) - 3.0 TDI 11.07 - Closed Off-Road Vehicle 176 240 2967 AUDI - Q7 (4L) - 4.2 TDI 03.07 - 06.09. 6 x 1 Litres of. KIT INCLUDES 16 MOUNTING SCREWS. AUDI - Q7 (4L) - 4.2 FSI. 03.06 - 05.10. AUDI - Q7 (4L) - 3.0 TDI. 06.09 - 05.12. 03.06 - 05.08. AUDI - Q7 (4L) - 4.2 TDI. 03.07 - 06.09. GEARBOX TRANSMISSION TYPE: TR-60SN / 09D ONLY! Your one stop quality parts shop. Huddersfield based distributor of quality branded parts for your car and light commercial vehicles at a fraction of the main agent prices. Any claims after 24 hours will be dismissed for a claim. Please be rest assured we strive in supplying branded OE quality parts which meet or exceed Industry specification. We strive to offer a 5 out of 5 star service to all customers! We aim to reply to all messages within 24 hours. FOR VARIOUS MERCEDES AUTOMATIC TRANSMISSION GEARBOX PAN FILTER SEAL + 7L OIL KIT. 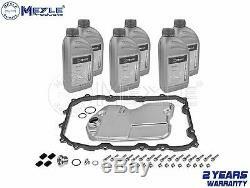 FOR BMW E46 E39 AUTOMATIC TRANSMISSION GEARBOX OIL FLUID 24341423376 ZF 5HP19. AUTOMATIC TRANSMISSION GEARBOX CONTROL UNIT CONDUCTOR FOR C E CLASS 1402700861. FOR BMW JAGUAR AUTOMATIC GEARBOX TRANSMISSION SUMP PAN FILTER SEAL 7L OIL KIT. FOR JAGUAR X TYPE REAR TRAILING SUSPENSION CONTROL ARM BUSH BUSHES XTYPE X-TYPE. Stay up to date with our special offers. The item "FOR AUDI Q7 TR-60SN 09D AUTO TRANSMISSION GEARBOX PAN SUMP FILTER ATF III H OIL" is in sale since Wednesday, December 17, 2014. This item is in the category "Vehicle Parts & Accessories\Car Parts\Transmission & Drivetrain\Gearboxes & Gearbox Parts". The seller is "johnyboy-1" and is located in GB. This item can be shipped to United Kingdom.